Naughty and Nice: The Christmas Jug Band are comin' to town. Blame it on the nation's Bicentennial. Bassist Tim Eschliman's brother decided to celebrate the occasion by sending his sibling a Wild Turkey whiskey commemorative decanter, a God-awful ceramic jug of 80-proof joy juice emblazoned with red, white and blue banners draped over a bird. "After I got the decanter, I called up a couple of friends and invited them to come over on Monday nights and polish it off," recalls Eschliman, a fixture on the North Bay music scene thanks, in part, to his role as the de facto leader of the irreverent Christmas Jug Band. "We used to sit around with Greg and Nick Dewey, and Paul Wenninger--who was Van Morrison's road manager--and get drunk and play this really hokey backwoods Appalachian stuff. We had a washboard and harmonica and everything. "It was fun, but it got to be a bit much after 10 Mondays of Wild Turkey and Bud." Rather than opt for sobriety, the ragtag jug band took their rustic acoustic grooves to the streets of Mill Valley. "We'd just show up on street corners and play until the cops came," recalls Eschliman, now a Petaluma resident. "We never thought of it as something where you would get a gig and play. We just did it for fun and invited Dan Hicks and a few others from the neighborhood." By happenstance, the musicians stumbled their way into a lucky break. Hicks, who had attained national celebrity in the '70s with his old-timey group Dan Hicks and the Hot Licks, hosted an open mic at the now defunct Marin County nightspot the Old Mill Tavern. Audiences came to hear not the music but Hicks' wry commentary on the acts. One December night in 1977, with Hicks out of town, Eschliman and his jug band sat in and performed a set of twisted Christmas songs between the various amateur acts. "I remember that the club owner, Mark Cushman, said, 'Hey, that was kind of fun. Why don't you put on a Christmas Eve show?'" Eschliman recalls. Twenty-seven years later, this one-off joke has become a Bay Area institution, with four campy albums to their credit and a full slate of holiday shows for local musicians more accustomed to scrambling for paying gigs. "In the beginning, we made a pact that we would never sell it out or try to make any money because it was just too much fun," says Eschliman, who spends the rest of the year playing with the R&B band Rhythmtown Jive, the Lost Planet Airmen and various pickup gigs. "It was meant to be comic relief from the serious bands that we're all involved in." It turns out that comic relief is a much sought-after commodity. In 1987, Eschliman and his pals decided to record the band. "We figured we'd make a few cassettes for our kids," he says. But Robin Cohen, owner of the San Rafael independent records distributor City Hall Records, caught wind of the tape and arranged to release a vinyl version. That recording soon caught the ear of the folks at Relix Records, who jumped at the chance to reissue the CD version the following year. Since then, the debut album has sold over 10,000 copies, more than any of the "serious" side projects the Christmas Jug Band members have been involved in. "I think the lesson is that people appreciate things that aren't so darned serious coming from musicians," Eschliman says. The Christmas Jug Band have seen their share of strange gigs, but one of the most eccentric was playing the half-time show at the long-forgotten Toilet Bowl, a friendly sandlot football game and charity fundraiser between patrons of the 2AM Club and the Brothers Tavern in Mill Valley. "We came up with a marching jug band formation: a martini glass with the bass drum player in the place of the olive," Eschliman recalls. "It was a blast." The Christmas Jug Band perform three North Bay gigs, beginning Saturday, Dec. 18, at the Raven Theater in Healdsburg; Sunday, Dec. 19, at the Rancho Nicasio; and Wednesday, Dec. 22-23, at Sweetwater in Mill Valley. 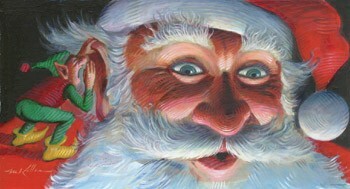 For details, visit www.christmasjugband.com. From the December 15-21, 2004 issue of the North Bay Bohemian.